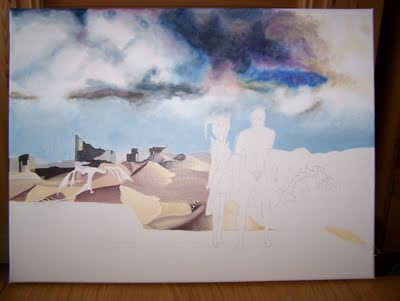 I was too tired when I returned home from Indie Tracks to start painting, so I've made up for it today - I've made a start on the sand dunes. 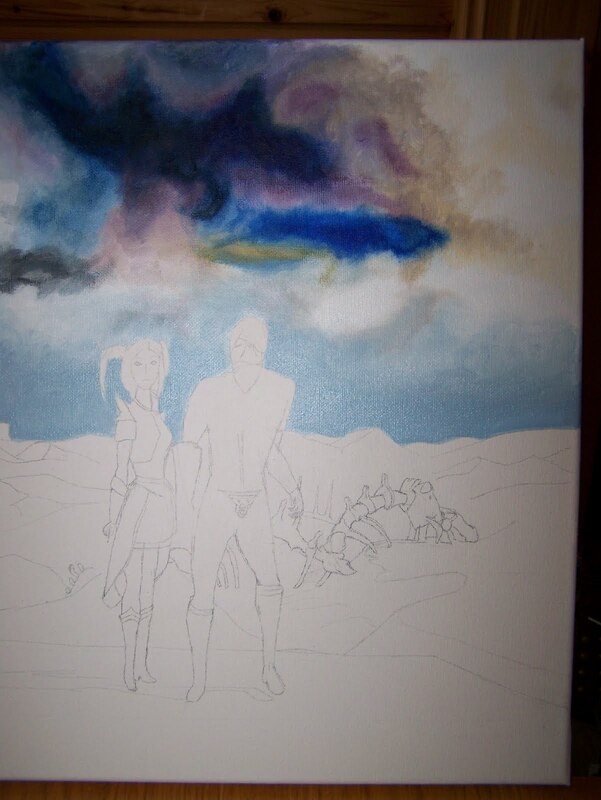 I've also fixed the sky - part of the sky was too dark and another too bright, so I've toned them down somewhat. 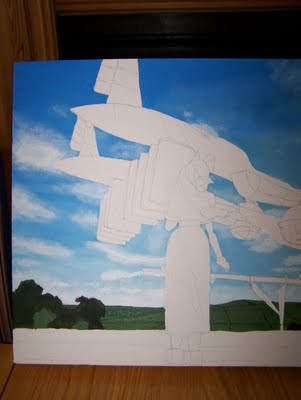 I'm looking forward to painting the dragon - I like dragons. 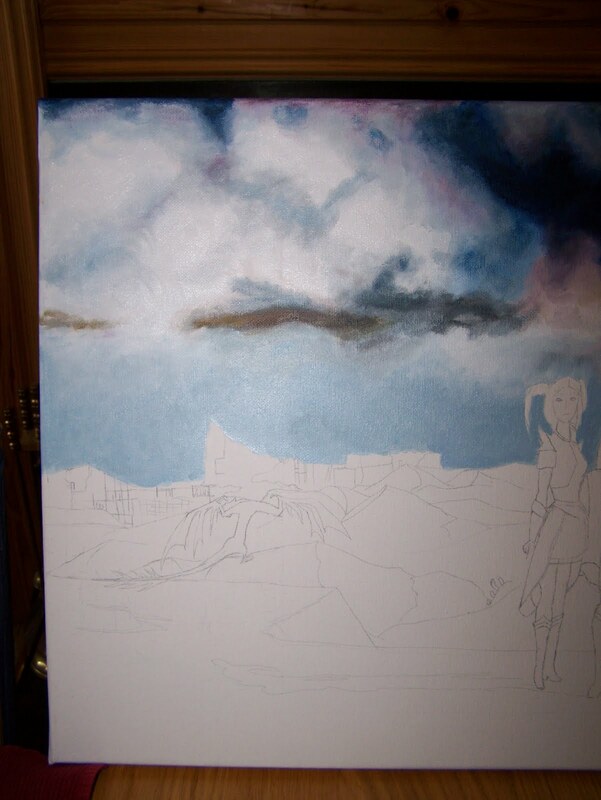 I love painting skies. Even when they're not all blue, there's just something wonderful about them, the way in which clouds change, how the sun affects them, and the wind, too. I've never seen a real life tornado, thankfully, but I bet it would be exciting! I've camped in a hurricane, but that's a different story all together. I may well go over it a little after I've painted the sand dunes, I'll decide then. Here is the list of people I'm painting for next to raise money for Oxfam. I've already started the first, I'll add to the list if anyone else emails me and i like the picture they want me to paint! 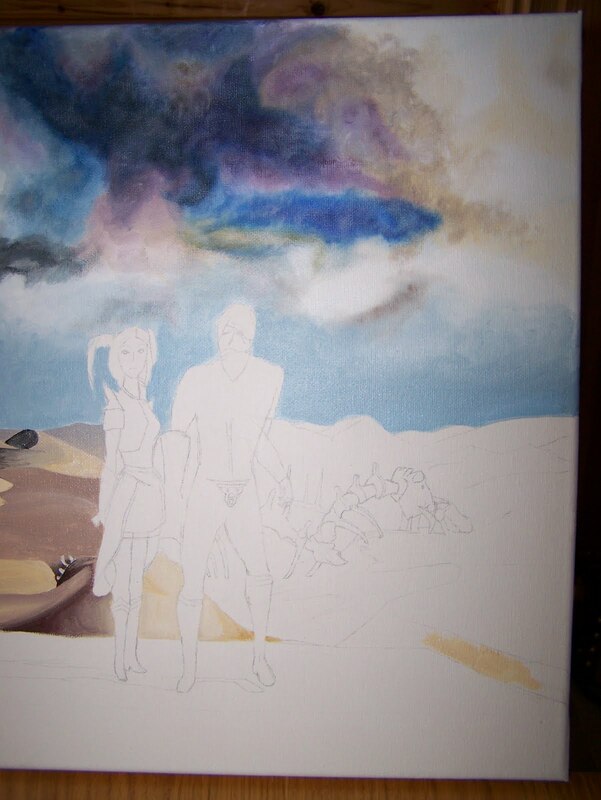 I've just started this commission - its of Kitten and Snake in Guild Wars. 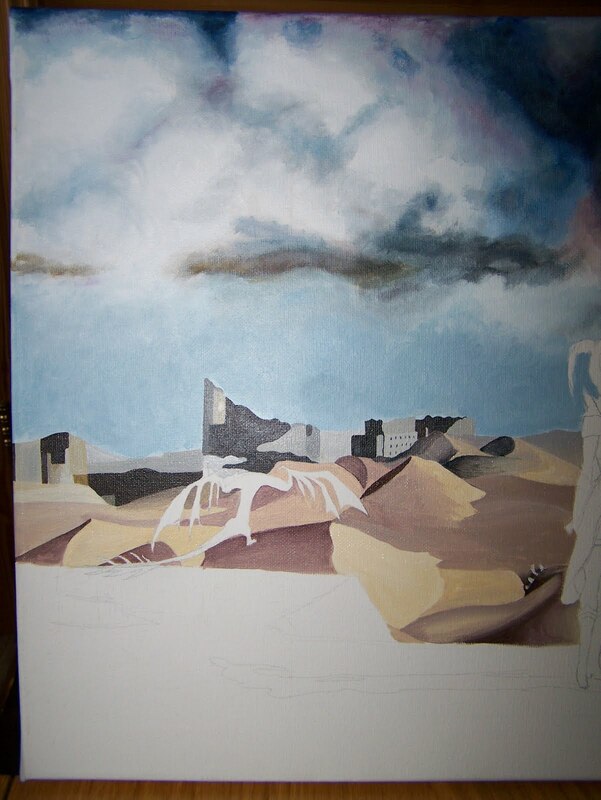 I'll be carrying on with this one as soon as I've heard that Thayer is happy with it so far. 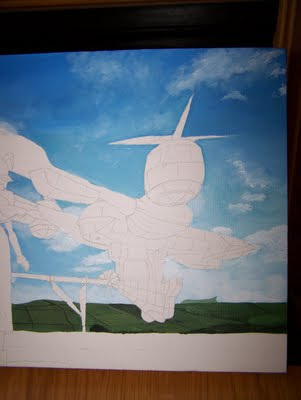 I've finally started painting this one - its the first off my new list, and is for MegaMan001, in Boston, Mass. 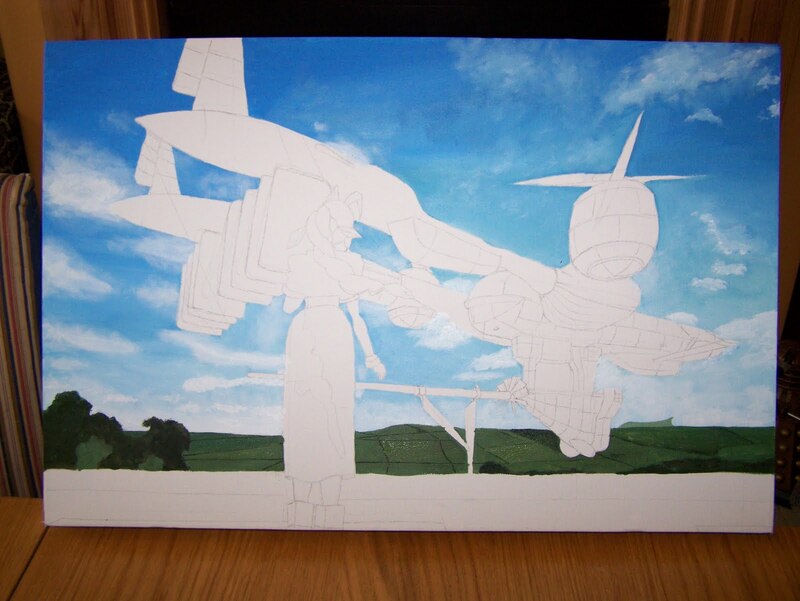 I started the sky - I painted the whole sky blue/blue-green, getting paler towards the bottom, then I added in the clouds. I then thought I'd get a head start on myself, and took photos of the painting with just the sky done, then did the fields, trees and shrubs. Then I realised I'd not put the SD card back in my camera (again!) and so hadn't got pictures of just the sky done. Grrrrr!!! I'm quite pleased with the sky on this one, but then, it is blue, so I'm bound to like it! The wrought iron was interesting - I wanted to do it free-hand - I had started a pencil outline first, but decided to do without. 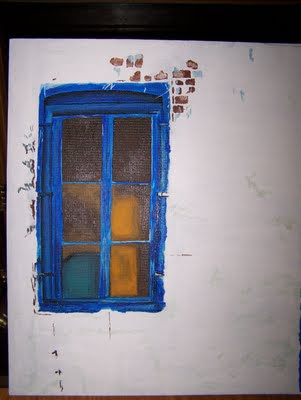 It was a challenge, but I enjoyed getting the differing tones of blue right. 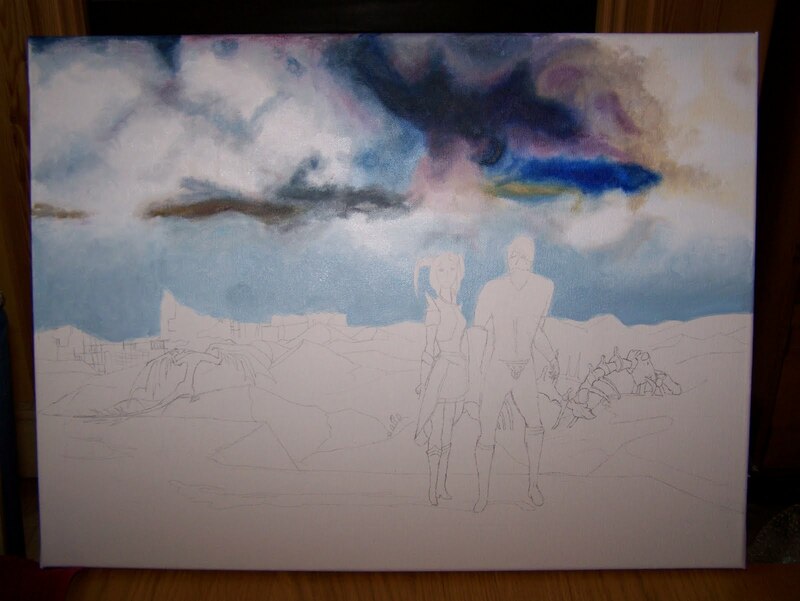 Anyway, it's done now, so I'll be starting the first painting on my new list next. 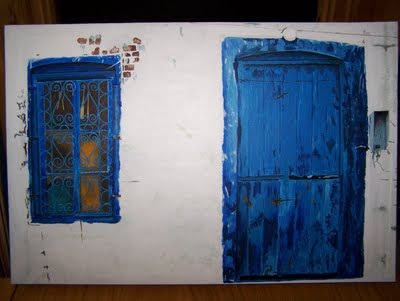 There are a couple of slots left if anyone would like a painting. If so, email me. I had to wait in for a delivery this morning, so i painted. I'm still waiting for the delivery, not impressed! 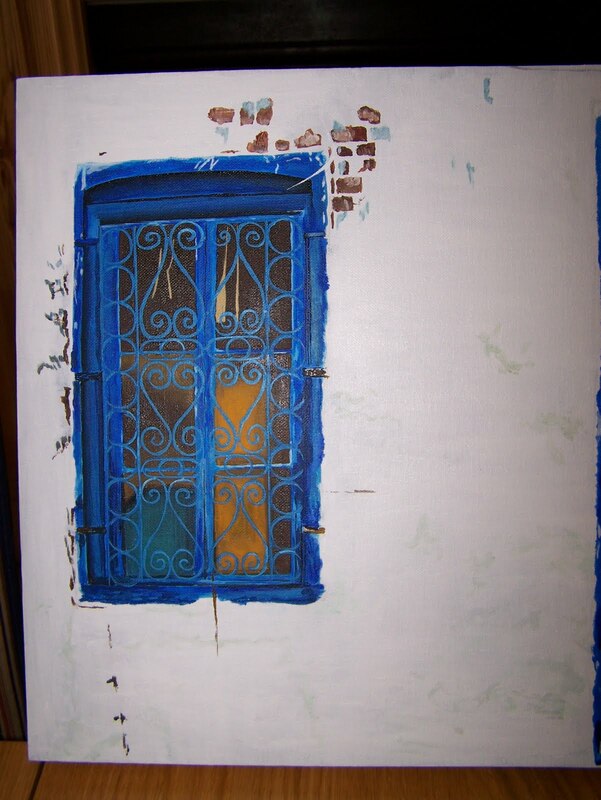 I've still to do the wrought iron grille-work on the window. This is the first non-game related painting I've done in quite a while, I've really enjoyed it, but that's also probably because of the blue! 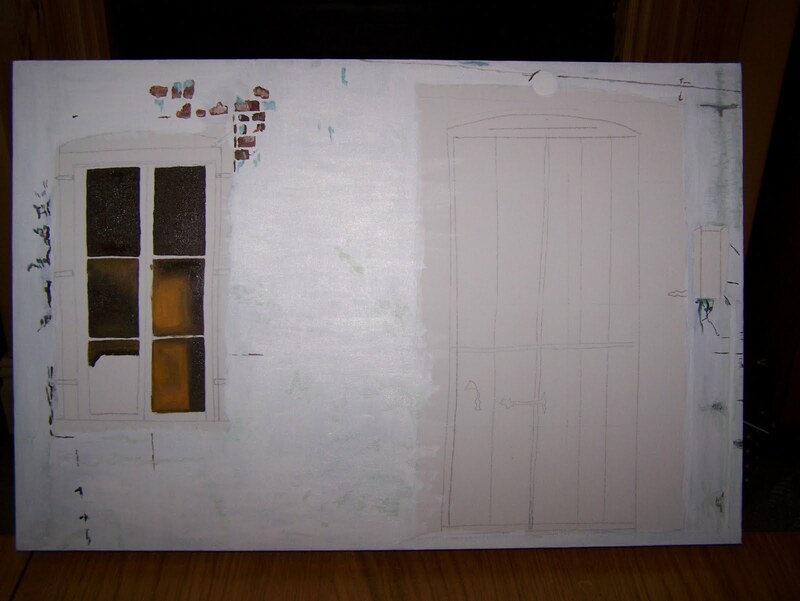 I woke up ridiculously early this morning, so decided to make a start on the base colours of the window and door. 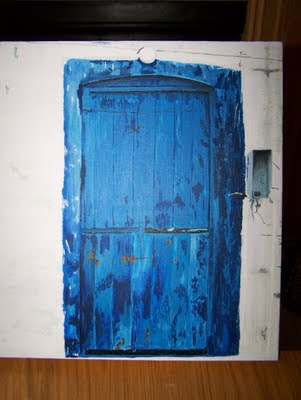 In the image I'm painting from, the paint has badly peeled off, and reveals a much paler blue on the doors. 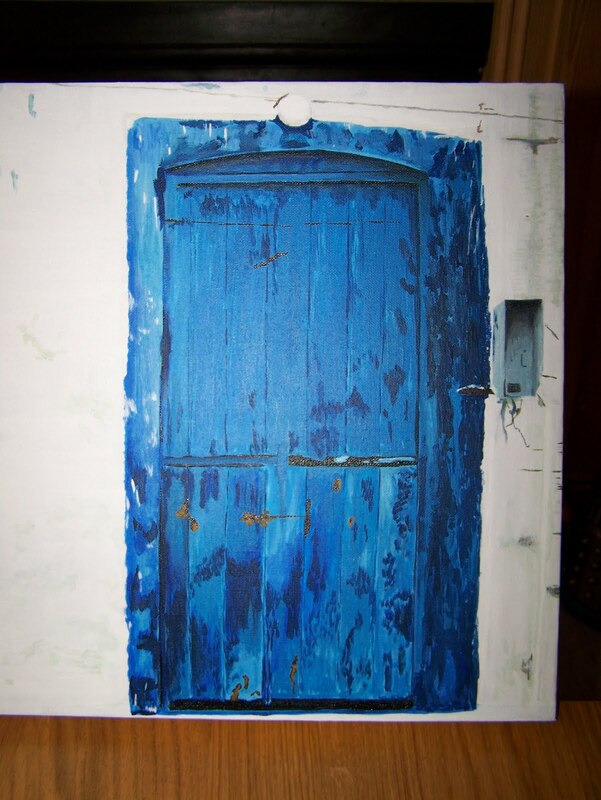 Having spent a week in Kalkan, I've seen first hand the vivid blue they paint their doors, I also saw lots of evil eye warding off totems - in jewellery, embedded in the concrete pavement and in doorways. 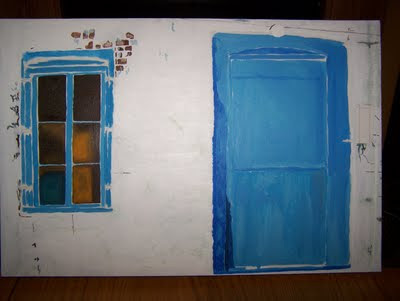 Its a shame this doorway doesn't have one, I might add one in, I'll have to see. I spent this afternoon trying to buy an outfit for the Queen's garden party I'm going to next week - sadly, unsuccessfully, so I'll have to try again later this week. 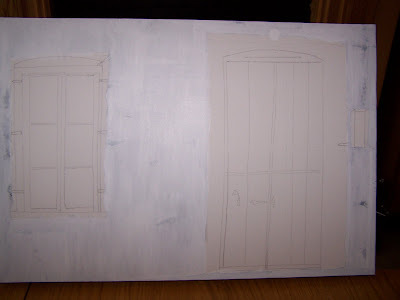 Here's a little more done - I think I've finished the background now, but I'll wait until I have the doors done before I completely decide that. 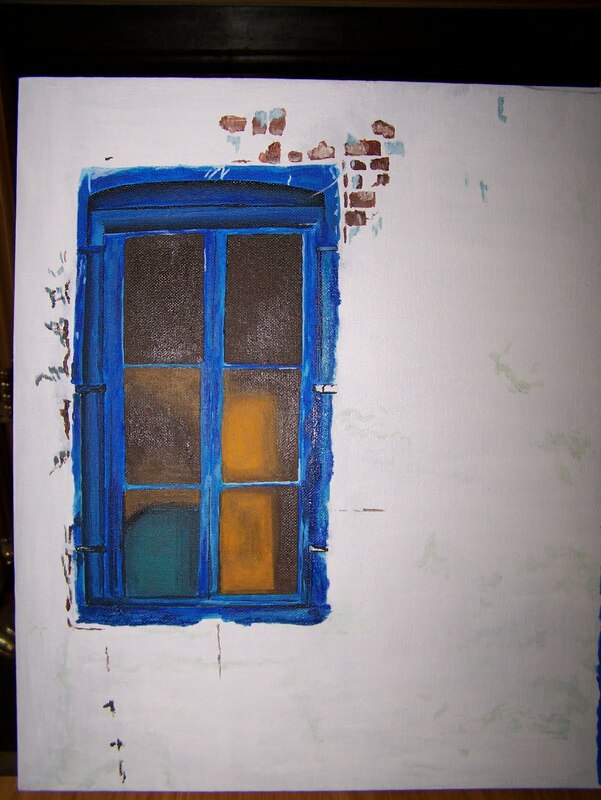 I've started the inside of the room as well - you can only get a glimpse of what's behind the wrought iron of the window frame, so far I've just done the colour blocking. I'll probably start on the window tomorrow afternoon. 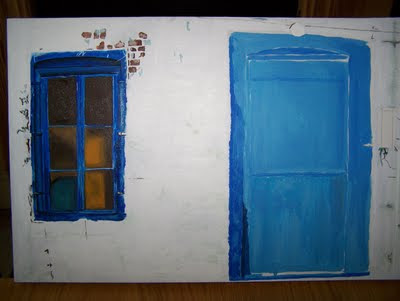 I took the canvas on holiday with me, and painted some of the walls. Its still not white enough, so I'll be overpainting it this afternoon for a while. I still have a couple of slots left on my Oxfam list, if anyone is interested, email me here.